Just 90 minutes outside of Cabo is a town that is such a hidden gem that I’m reluctant to really share it. However, to keep it to myself would be a shame as La Paz is a place that everyone should experience at least once. While Cabo is known for large resorts and a lively night scene, La Paz is the complete opposite and is best for those who want a real adventure. La Paz is the capital of Baja California Sur, a Mexican state on the Baja California Peninsula. Most of the bars and restaurants overlook the water and the city is known for its water activities such as swimming with whale sharks, sea lions, and stand-up paddle boarding. If you’re not a strong swimmer, like me, rest assure that these activities are guided by experienced professionals who will work with you to make sure you feel safe the entire time. I was invited to visit La Paz with a group of amazing and badass travelers in the industry, and together, we spent 5 days and 4 nights immersed in the city’s culture from the food to the history of La Paz. Within the first day, I fell in love with La Paz and by the second day, I never wanted to leave. With a gorgeous ocean within reach, beautiful sunsets every single day, and homemade ceviche every morning, I mean, would you leave? We were hosted by Hyatt Place in La Paz. Our stay included daily breakfast and our rooms were quite spacious. I have to admit I can’t say too much about the hotel as we spent majority of our trip exploring La Paz. Therefore, all we really did was sleep at the Hyatt Place. The beds are comfy and my view wasn’t too bad to wake up to either. Never would I have imagined swimming with whale sharks, nor did I think I get to see about 6 of them in one afternoon. Tuna Tuna Tours took us out for the day to the Sea of Cortez, where we got to experience two epic swims and a delicious lunch on the beach. We started with an hour long boat ride to our destination, where the whale sharks were currently eating and safely got into the water to see them up close. The whale sharks are completely protected by the government and therefore, we were careful to follow all the rules that applied. I have to admit that it was very intimidating because they’re huge! However, they’re very peaceful and didn’t mind us being around them. We spent about 30 minutes admiring these gentle creatures before heading off to Espiritu Santo Island to swim with sea lions. Sea lions are not only cute, but also very playful and curious. However, we were careful and abided to the regulations to ensure both the sea lions and we were safe. We never swam up to a sea lion but had several swim underneath us and around, probably wondering who we were and why we looked so funny with our snorkel gear on. It was such a delightful afternoon spent with amazing animals. Note: if you get seasick easily, bring medication with you and be prepared for a bumpy ride. The last time I went paddle boarding, I ran someone over with the board. However, he saw me coming and could’ve swam out of my way, so it technically wasn’t my fault. Luckily, this experience went smoothly and the only thing I hit was a mangrove or two. For someone who has no sense of balance, I didn’t fall at all and was able to stand for the majority of the tour. I believe we spent two hours on the water and about 30-40 minutes on the beach, chowing down on homemade ceviche. To be fair, the water isn’t really deep and when the sun is out, you can see underneath you while you paddle. We saw all sorts of fishes and I even had a heroine fly away right in front of me. We got some time during trip to explore the cute town of La Paz. I loved the architecture and each corner was picture perfect. There are plenty of great murals and sculptures around, in addition to local boutiques. I certainly did not leave empty handed! By the way, the sunsets here are absolutely gorgeous and worth watching. I have to be completely honest and admit that I chickened out of the surf lessons. I had a panic attack right before we hit the ocean and stayed back, as I have a real fear of drowning after two incidents when I was younger. However, that didn’t stop me from at least getting some cute shots while everyone else was having fun. To be clear, the instructors did their best to make me feel comfortable but I just couldn’t bring myself to do it. It was my own choice to not try it but the other girls felt completely safe and had a blast. 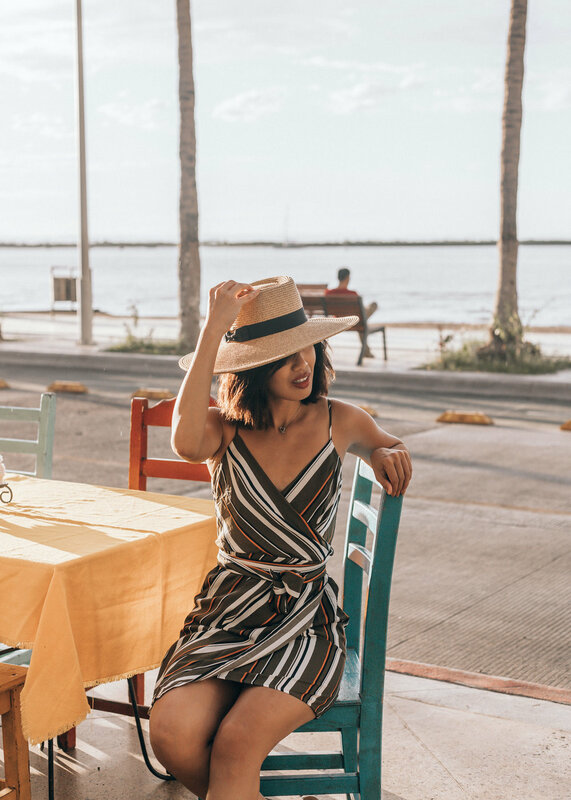 Close to Cabo is the most Instagrammable town called Todos Santos. We spent a few hours roaming around the stores, ice cream shops, and even stumbled upon a chic hotel called Hotel Casa Tota. This place is a must-visit when you’re in La Paz or Cabo. We had the best meals during our trip and while I can’t remember exactly what we ordered at each, I do know that everything I ate was good. Try out these places during your trip and I promise you won’t be disappointed. With La Paz being so close to us (in LA), there really isn’t an excuse not to visit. Spend a weekend getaway with your significant other or your girlfriends in La Paz next time, and skip the chaos of Cabo and Cancun. I promise you’ll have the best time! Thank you to the tourism board of La Paz, our guides, and to girls on this trip – you made this one of the best experiences I’ve had in awhile.